The City Council in Birmingham, England, recently sent out leaflets to all households congratulating them for meeting targets by recycling their rubbish. The leaflets cost £15,000 to produce. Under the headline “Thank You Birmingham!”, the leaflet showed a picture of the Birmingham skyline. Unfortunately for the council, the photo was of Birmingham in Alabama, and not of the West Midlands city. Very similar views of Birmingham in the US are the first images that are found by a Google search for “Birmingham skyline”. However, the image that was used apparently was bought from the iStockphoto image library. It would appear the image in question is 1478222. When searching for Birmingham on that site, it does default to Birmingham (Alabama), but this is clearly indicated, and it asks underneath if you meant Birmingham (West Midlands). There are actually some nice skyline images of the “right” Birmingham on there. The worst part of this episode is that when the mistake was pointed out, the council initially claimed there was no mistake, and that it was a “generic skyline intended to symbolise an urban area”. Naturally, it was therefore an amazing coincidence that the city used to represent a generic skyline happened to be the American city that bore the same name. This is not the first time that a similar mistake has been made. A few months ago, a group of Conservative MEPs also used a picture of the Alabama city on their website by mistake. Perhaps as MEPs for the West Midlands, and Tory ones at that, they had never actually visited Birmingham to know what it looked like. It isn’t just the British that are prone to mixing the cities up, either. An American company used a picture of Birmingham, UK to advertise the renovation of the Thomas Jefferson Hotel in Birmingham, Alabama. 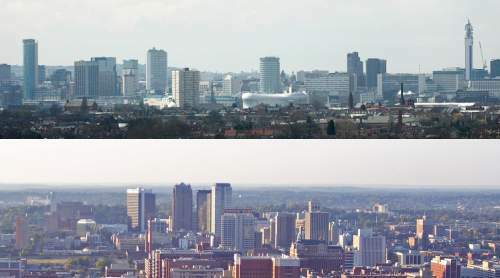 Spot the difference: the English Birmingham (top) actually has a distinctive skyline, with the Holloway Circus Tower, Hyatt hotel, Alpha Tower, famous round Rotunda and BT Tower, as well as Selfridges visible in the foreground. By contrast, the Alabama city (bottom) does not have a very exciting skyline by American standards. (The aforementioned hotel is the small building on the far left.) Aside from the fact the leaflet was simply wrong, it would have looked far more inspiring had it depicted the correct city! Birmingham UK skyline (top) by Ian T Edwards; Birmingham AL skyline (bottom) by Andre Natta. Both images used under the terms of their Creative Commons licences. The above derived image is released under a CC Attribution-Non-Commercial-Share Alike licence. And how do you thing the council reached those targets for recycling? By sending us rubbish leaflets that we have to stick in the recycling. It’s all measured on output. If they hadn’t bothered in the first place they wouldn’t have recycled as much. If anybody from the council is reading this and is after a photo to use on a future leaflet then get in touch.